Can’t commit to three months? 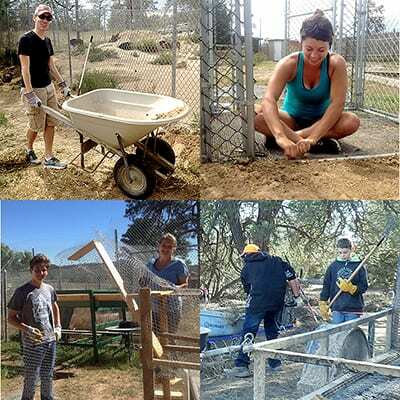 If youre visiting our sanctuary and would like to help with a project, Wild Spirit’s Weekend Warrior initiative is a great way for you to help out while still enjoying the sanctuary. We have had many individuals and groups join us in helping the animals for a day or weekend, including boy scouts, girl scouts, and family groups. Past Weekend Warrior projects have included landscaping, campground clean-up, maintenance projects, and assistance at outreach events. Many individuals have loaned a specific skill to help complete a project, such as creating new animal signs or building a fence. As a thank you to groups performing a service project, we discount your stay and tours! To learn more about group packages available to Weekend Warriors, contact us! If you are interested in becoming one of our Weekend Warriors, please complete our Weekend Warriors Inquiry Form. **NOTE: Sending in the inquiry form DOES NOT mean you are guaranteed the requested date or project. Please wait for one of our staff to contact you to verify. If you have any additional questions, please contact us. We look forward to hearing from you! *Your tour guide is an unpaid volunteer and would appreciate a tip. Our standard tour takes you through our sanctuary with a volunteer tour guide. Learn all about what we do, the stories of our rescues, and what it takes to keep us running. Feeding Tour – $20 for the first person, $5 for each additional guest. 15 people max. Join us for our 9:30am feeding! Watch as the animals devour their breakfast and enjoy a chance to throw some meat to hungry wolves. Give your group the unique opportunity to meet a wolf and learn more about wild canids. Group Camping – Prices will vary depending on group size.